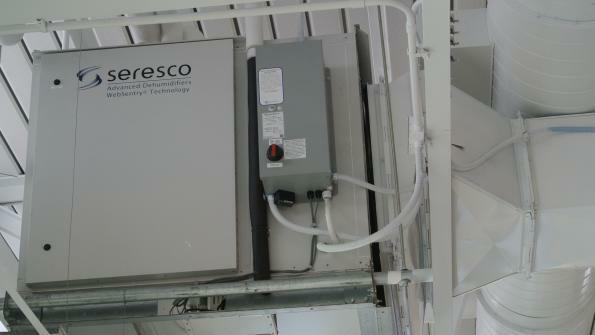 Seresco USA’s NP-Series Protocol commercial dehumidifier is enhancing air quality for swimmers and others at the Linn-Mar Aquatics Center in Marion, Iowa. Seresco USA’s NP-Series Protocol commercial dehumidifier is enhancing air quality for swimmers and others at the Linn-Mar Aquatics Center in Marion, Iowa. The center is part of the Linn-Mar Community School District. Installed in September 2015, the dehumidifier uses 85 percent less refrigerant than conventional equipment, according to the manufacturer. The equipment maintains a 50-percent relative humidity and robust ventilation. It uses heat recovery for space and pool water heating. The model NP-064 dehumidifier — which uses heat recovery for free 80-degree pool water heating and pre-heating outdoor air — has an array of three direct-drive supply air fans that help balance the ventilation system. The direct drive and its accompanying energy-conserving variable frequency drive (VFD) capabilities offer fan efficiencies compared to conventional belt drive systems, according to the manufacturer. Touch-screen control systems and 24/7 remote Internet monitoring ensure easy and efficient dehumidifier operation. The dehumidifier uses environmentally friendly, inexpensive glycol for heat delivery to outdoor dry coolers. The system does not consume potentially environmentally damaging refrigerants, which may be used in a conventional mechanical dehumidifier. The equipment helps lessen the school's refrigerants dependency and the potential liabilities associated with anticipated refrigerant environmental bans and resultant price increases. The Linn-Mar facility's indoor air quality and comfort have made it a sought-after venue for state and regional swim competitions. The aquatics center’s energy efficiency will save taxpayers money in the long term, according to the manufacturer. "We notice a definite difference in our air quality as compared to other natatoriums," Linn-Mar Aquatic Center Manager Bobby Kelley says.